If your thoughts are already looking to what changes you want to make in the New Year, why not try my FREE 5 day plant-based series? 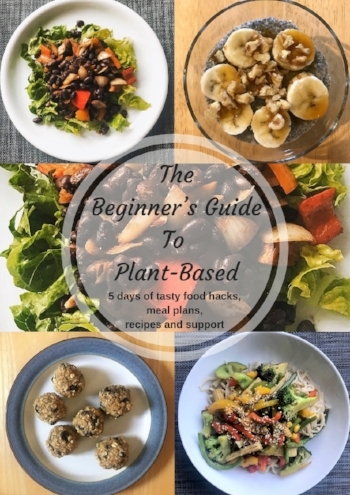 Designed for beginners to give you all you need to know to kick-start your healthy plant-based lifestyle. Sign up here. Well, I’m not talking about the caramel covered or salted ones! By the way, nuts also contain protein and fibre, which means a small amount can go far in terms of filling you up. Not to mention the vitamins and minerals you can get from nuts. Tip: Put a handful of unsalted/unsweetened nuts into a small container to keep in your bag, drawer or car. Yes, fresh fruit contains sugar, but whole fruits (I'm not talking juice or sweetened dried fruit) also contain a fair bit of water and fibre; not to mention their nutritional value with vitamins, minerals, and antioxidants. And fresh fruit is low in calories. Fibre is something that not only helps to fill you up (known as the "satiety factor") but also helps to slow the release of the fruit sugar into your bloodstream and reduce the notorious "blood sugar spike." Try a variety of fruit, but especially berries, and pair with a handful of nuts. Tip: Can't do fresh? Try frozen. Plus, they're already chopped for you and you can always have some to hand. Can you see how great these tiny guys are? You might not think of pulses when you think of snacks, but there are lots of things you can make with them. They are great for weight loss because they have both fibre and protein. They can help you manage cravings by regulating your blood sugar levels as well as keeping you full. How do you make a snack with these? One of the most popular options is houmous – recipe below. But you can make a dip, pâté or sandwich spread with lentils, beans or peas. Or what about crackers? Another great option is to roast some chickpeas with spices. Veggies contain fibre and water to help fill you up, and of course are packed with vitamins, minerals, and antioxidants. Tip: Use a bit of dip. Have you put almond butter on celery? How about trying my new houmous recipe below? Go ahead and try one, or more, of these healthy snacks. Prepare them the night before if you need to. They will not be "tasteless," like "cardboard," or "completely unsatisfying." Don’t forget - If you want to start the New Year the right way sign up to my FREE 5 day plant-based series. Designed for beginners to give you all you need to know to kick-start your healthy plant-based lifestyle. Sign up here. Newer PostCan My Symptoms Actually Be a Food Intolerance?